3for5 Blog: Olympus Junior High Students Inspire! Olympus Junior High Students Inspire! Students at Olympus Jr. High School (OJH) in Salt Lake City, UT were inspired by their teacher Sarah White to sell handmade Threads of Hope bracelets to help give water to students in Nigeria. 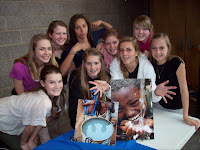 In addition to raising money to support the people who made the bracelets, OJH students brought in $1,321.25 for water! Their efforts were so rewarding that students want to focus on raising funds monthly for the rest of the school year. Thank you and way to go, OJH students!